On Friday, January 18, 2019, at approximately 2:58 PM, the Sheriff's Office Dispatch Center received a call regarding a shooting in the 4300 block of Lashelle Avenue. When deputies arrived on scene they found a deceased male. Through the course of the investigation the identity of the suspect was made known to law enforcement and through the combined efforts of the Sheriff's Office Patrol Division and the Colorado Springs Police Department Tactical Enforcement Unit, they were able to take the suspect into custody without incident. 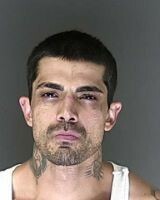 The suspect has been identified as Emilio Esteban Espinoza, DOB: 5/11/87. A former mug shot is attached to this media release and a current mug shot will be released once the booking process has been completed. The identity of the deceased male will not be released until the Coroner's Office makes positive identification and the next of kin is notified. The Sheriff's Office would like to thank the Colorado Springs Police Department Tactical Enforcement Unit for their assistance in this case.